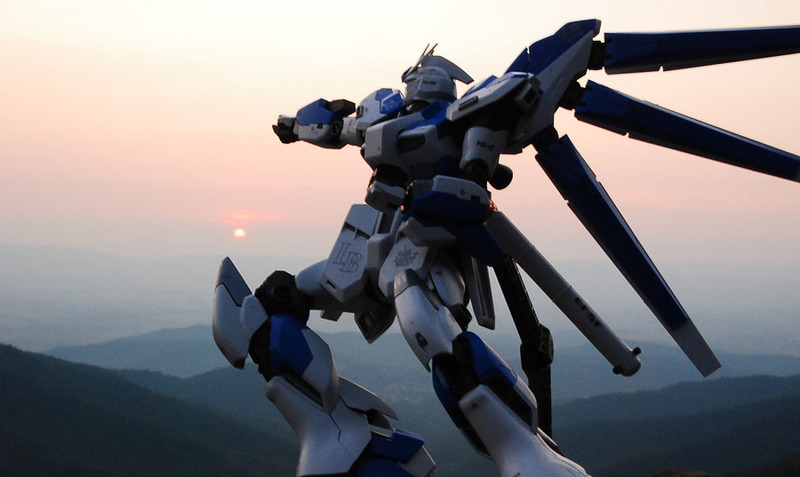 Hi-V Gundam flying towards the horizon. After finishing the Perfect Grade Strike Gundam I went looking for more PG’s to buy. I surfed around the web and saw what was available and there really wasn’t anything that really compared to the awesome designs of the Strike. I knew there were High and Master Grades, but in my mind why bother going down(HG,MG) when you’ve already started with the top(PG). That’s when I saw the MG Hi-V. 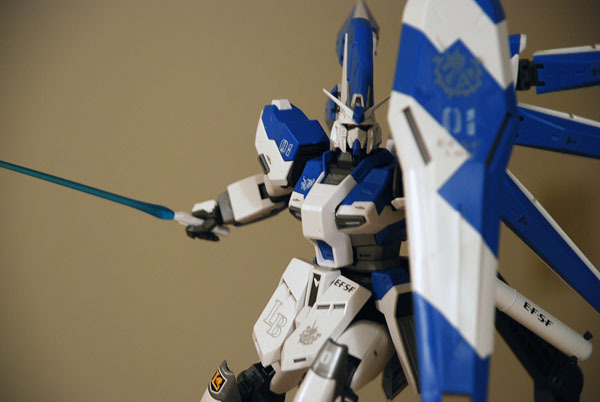 Looking at other people’s model of the Gundam, especially this guy’s, I went ahead and bought the Hi-V. How did it turn out? The Hi-V Gundam never appeared in any animated form at all, but in a Japanese novel adaptation of the Gundam movie: Char’s Counterattack. 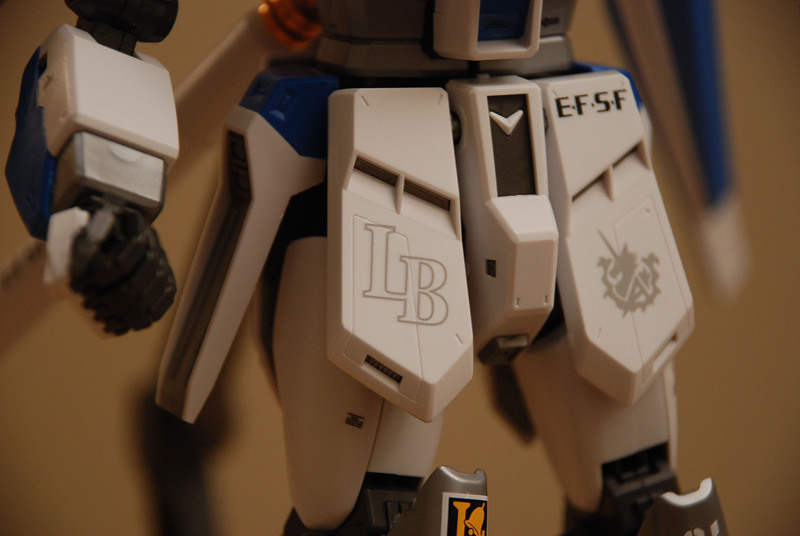 From what I gather it’s rare that Bandai commissions work outside of any of the animated Gundam series. But just by looking at the design above, I hope this becomes a regular thing, especially given the current Gundam novel art. Putting together the Gundam was a piece of cake. It took me less than five hours at most to complete it, compared to the monsterous 2 and a half days with the PG. But does less work time equal less maneveurability? Not at all. In fact it’s almost as articulate as a PG and the details are outstanding. With the latter, I attribute it to these fantastic decals you rub on to the model and weapons that look better than stickers. 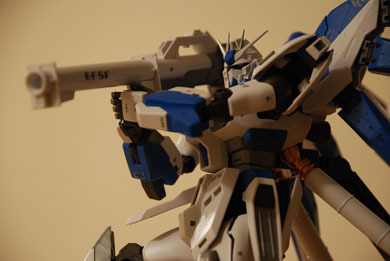 Hi-V using enhanced Hyper Bazooka. Aforementioned decals. Alternate angle #2. Cosmic defender. The Hi-v comes with an enhanced bazooka, beam rifle, 2 double bladed beam swords(can configure to 1 if needed), shield, and it’s 6 fin propeller/weapon systems which look like wings on the back. Beam Rifle and Enhanced Bazooka. 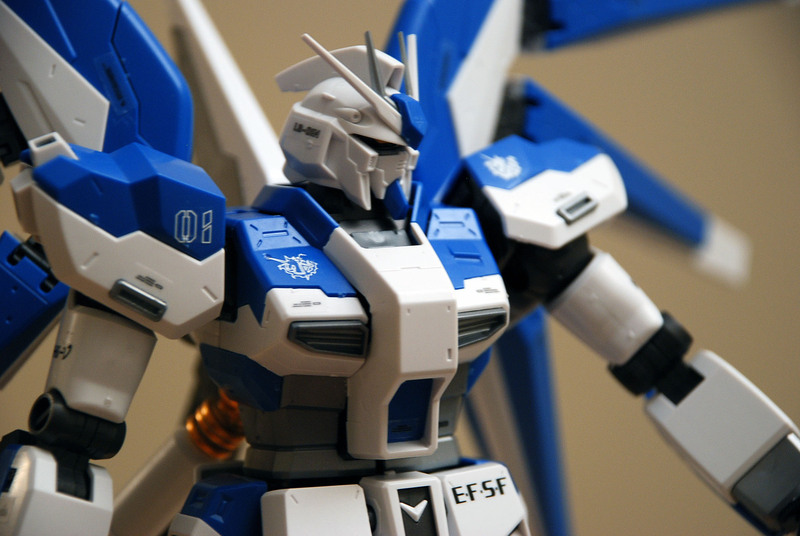 The model is really sturdy with the only exception being the fins connected to the back of the Gundam. 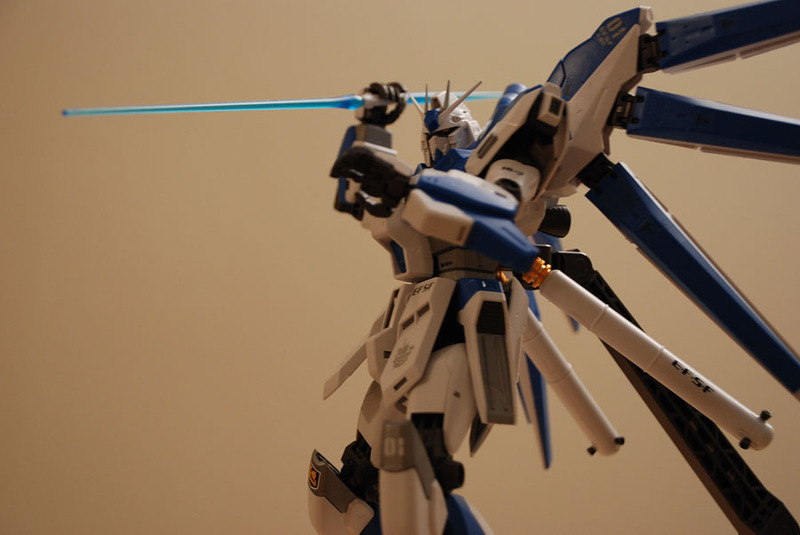 I found at times whenever I tried to move the Gundam around to a different position one or two of the fins would come off. They don’t have the strongest lock and hold. What I am thankful for is the stand that came with it. It’s possible to stand the Hi-v upright with the fins attached, but you’re limited because of the weight on the back. With the stand it’s not a problem to have the Gundam in different versatile positions. Atmosphere breakthrough. Fin system. Death from above. All in all, the Hi-v exceeded my expectations. I’ve seen Master Grades before but when compared to the Perfect Grades, they just didn’t do it for me…that is until I purchased one. The Gundam is a great piece to my collection and I hope to get more Master Grades with this kind of quality. Man! 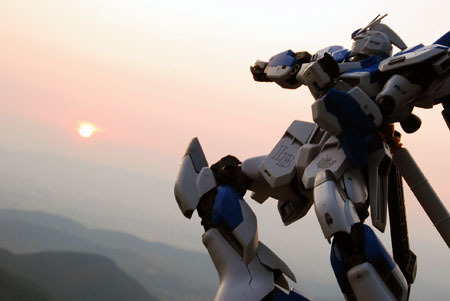 The Gundam looks amazing! Nice work!I’ve used decals on all my models and they are much better and you can see the results. it’s pink floyd! lol my brother used to play that song on his guitar when he was in a band. i like the video, it matches up with the song very well. Those are some great pics. I’ve went ahead and ordered this one, so I should be getting mine as well. Nice work and awesome first pic on the mountains. Looks cool. And great photos. Your shots are too cool, surf! If only they would put this design to animation… but I still liked that Amuro piloted the Hi Nu on CCR. @Anthony, Lanie, Danny, John=Thank you very much. I’m liking the Hi-V more and more, and my camera! @Jana=I could play a little of the solo but not much. @Toji-I have yet to see CCR. 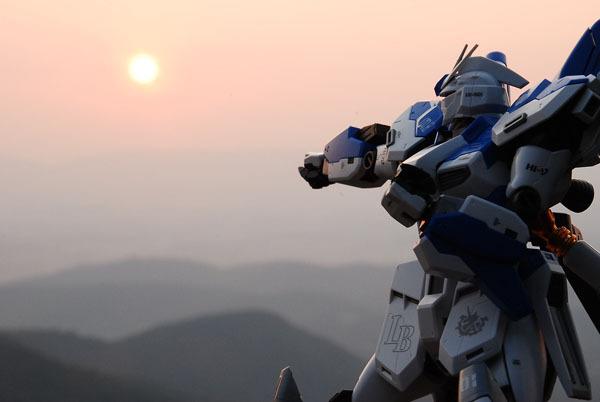 I know it’s bad being a Gundam fan, but I’ll get to it! I just might have to do that. Been looking to update the site a bit. @Xiao – It’s an awesome model. I’m thinking about inking it to make it even more spectacular. @Yasseranas – It was pretty hard to get it positioned right on the side of a mountain, but I was able to get a pretty good shot of it. Excellent work! 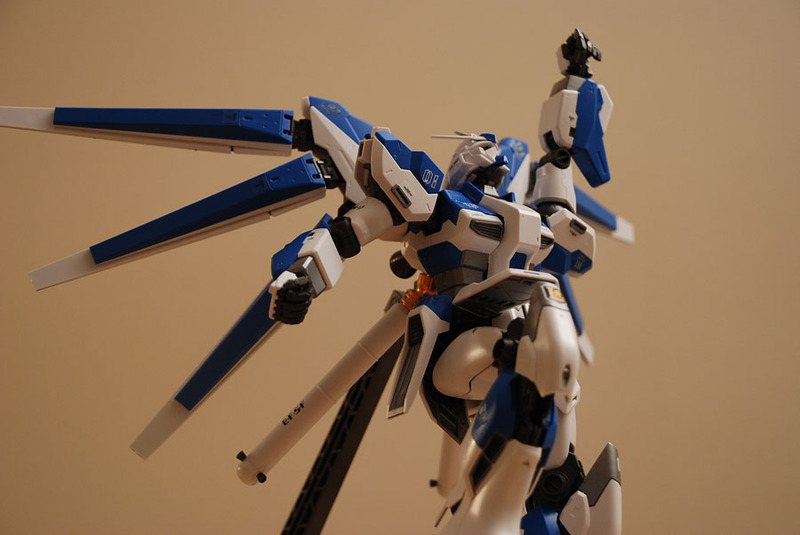 I’m glad you liked building the Hi-Nu model kit! Cheers! Nice job, I was wondering if you painted it, because I cant really tell. But, yeah VERY GOOD JOB! Really liked the first photo. Nice close ups, I’d like to some Gundam Wing. 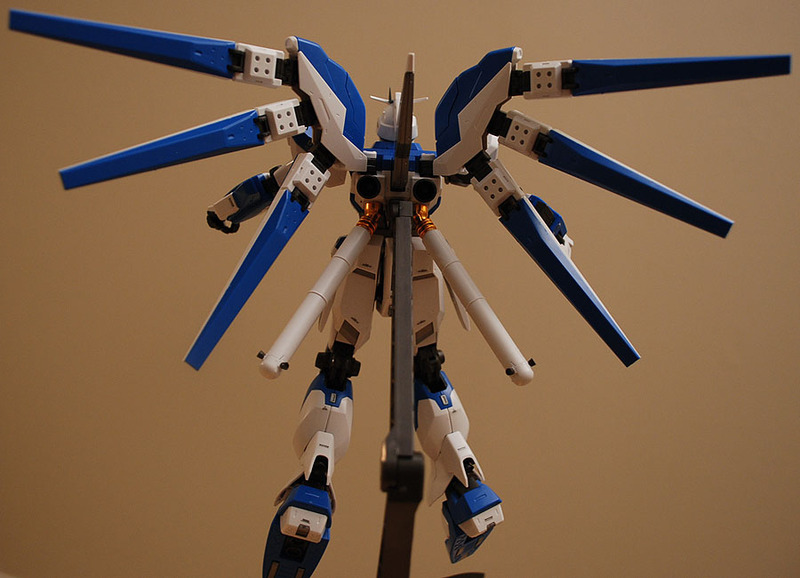 Yeah, that’s technically Hi-‘Nu’ Gundam. As in the Greek letter new, as it follows the traditions of Zeta Gundam (Double Zeta isn’t a Greek letter) and Xi Gundam that appeared as a manga in between Double Zeta and Char’s Counterattack. 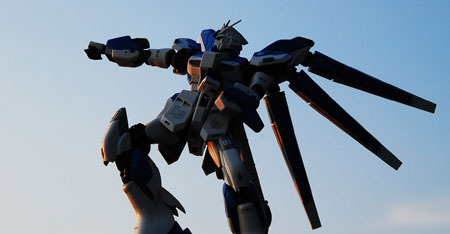 V Gundam is reserved Victory Gundam, that series at the end of the U.C. universe.